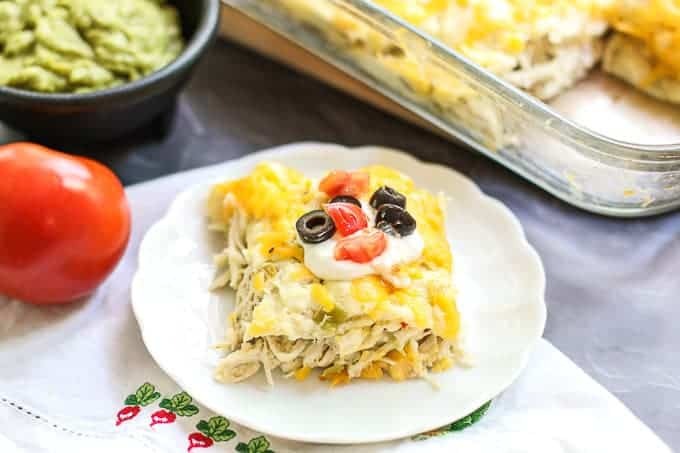 This Cheesy Chicken Enchilada Casserole fills a 9×13 baking dish, perfect for feeding a crowd or freezing half for later. It is loaded with Pepper Jack and Cheddar cheese with a semi-spicy chicken filling. Top this chicken enchilada casserole with black olives, salsa, and guacamole and you have one easy, delicious meal! YUM! This isn’t your every day enchiladas. 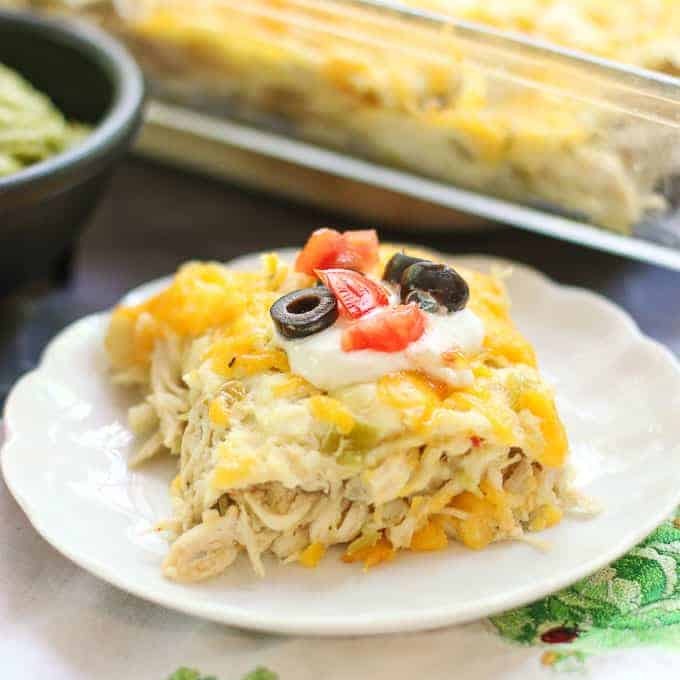 My chicken enchilada casserole recipe has a bit of a Southern twist. Unlike true authentic versions with enchilada sauce, I mix sour cream, cheese, and cream of chicken soup to make a creamy white sauce. It is very “Southernized” but still very, very delicious. It is the perfect casserole for entertaining big crowds or making for family night dinner. 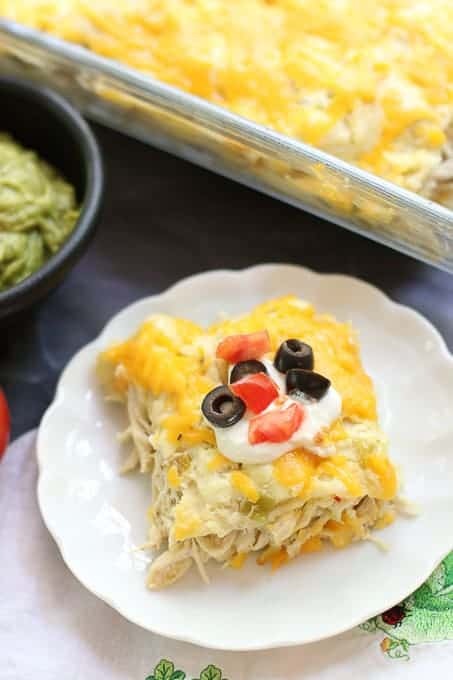 Because there is no “true” enchilada sauce for this chicken enchilada casserole, you can top this with all your favorite Mexican toppings such as salsa, guacamole, sour cream, cilantro, olives, tomatoes, onions…. etc. I prefer just a little guac and salsa myself. If you are wanting to use a real homemade enchilada sauce, I recommend making Cookie and Kate’s recipe. Just pour it on after cooking. The ability to interchange the toppings makes this a fun meal for crowds. Everyone gets their enchilada just how they like it. To make this Chicken Enchilada Casserole you first make the sauce. Set aside 1 1/2 cups of the sauce. Next mix shredded chicken with the remaining sauce. Add 6 tortillas to a 9×13 baking dish. Top tortillas with half of the chicken mixture. Next top with 6 more tortillas. Then add the remaining chicken mixture. Next add 6 more tortillas. Then you top with the remaining sauce and finish with cheddar cheese. After baking for 40 minutes, you serve! This Chicken Enchilada Casserole would be great served with my Mexican Quinoa . For dessert you can serve Mexican Fried Ice Cream. *Note: I use 2 cans of green chiles for spice and flavor. If you don’t want it spicy, use one can. This Cheesy Chicken Enchilada Casserole fills a 9x13 baking dish, perfect for feeding a crowd or freezing half for later. It is loaded with Pepper Jack and Cheddar cheese with a semi-spicy chicken filling. Top this chicken enchilada casserole with black olives, salsa, and guacamole and you have one easy, delicious meal! YUM! Mix pepper jack cheese, sour cream, cream of chicken soup, cumin, green chiles, salt and pepper together. Set aside 1 1/2 cup of mixture. Combine shredded chicken and remaining sauce mixture. Spray 9 x13 baking dish with cooking spray. Layer bottom of dish with 6 corn tortillas. Add half of chicken mixture over the tortillas. Layer 6 corn tortillas over the chicken mixture. Add remaining chicken mixture over corn tortillas. Add last layer of corn tortillas. Spread remaining sauce mixture over the corn tortillas. Completely cover with cheddar cheese. Bake 40 to 45 minutes until cheese is completely melted. Serve with favorite toppings such as salsa, guacamole, olives, onions, and tomatoes. For a milder recipe, use 4oz green chilies instead of 8oz. I have never frozen it, but I would imagine it would be fine. I would freeze it before baking it, thaw it out completely, then bake. I would add about 15 minutes baking time because you would be cooking it from a cold temperature. It also would be fine to make ahead a day and refrigerate. Again, I would refrigerate before baking and add about 15 minutes baking time because you would be cooking it from a cold temperature. I am guessing adding the 15 minutes… It may be a little less or more. Just check to make sure it warm all the way through and cheese is completely melted. This looks so so yummy. Can this be made ahead — possibly frozen or refrigerated for a day or so? I can’t say no to enchiladas and this one looks easy to make! This will make the perfect weeknight meal and keep the family happy. Thank you so much for sharing. I am so glad ya’ll liked it! That made my day. Made this for dinner last night and it was so good! Even my picky eaters gobbled it right up! Dinner for tonight is sorted. Thank you for sharing. Oh my! This is right up my alley! I love homemade Mexican food. SO tasty!